If you are a huge lover of Foxtrot like me, then the UK Large Mad Hatter Charisma LP 1st Press is the way to go. A lovely sounding LP and way better than everything else. smctigue, richarm, ParloFax and 1 other person like this. 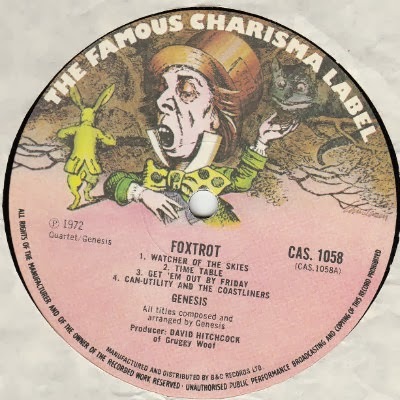 The original 'Foxtrot' is indeed fine: early UK Charisma release with 'Porky' in the run-out is my go-to copy. A recent minty eBay purchase too (£16), so there are good versions to be had if you're patient (it helps when the seller isn't quite sure what version they're selling, so ask the right questions). For 'Trespass' and "Nursery Cryme' you need the pink scroll versions, and they definitely are pricey now (though I recently picked up another scroll copy of NC for £25). The 'Porky/Pekco' cuts of SEBTP and TLLDOB are great too: I've never understood people's issues with these original vinyl releases, but late 70s reissues are not in the same league (especially Trespass and SEBTP). Did I read somewhere on here that the original Lamb in the US has a hum during the quieter parts of the album? same...my least favourite gabriel album...suppers ready doesnt do it for me. The first Porky cuts for the UK and US have hum thru the entire album. ultron9 My mostly Vintage System, 80s through mid 2000s. All the Classic Records Genesis reissues are mandatory! I don't mind remixes. I don't like the Genesis remixes because of the compression. To me they sound terrible - way too loud, with a loss of dynamics. All the Steven Wilson remixes I've heard sound great. Wish he could have done the Genesis albums. I like the Classic records lps very much, but the quality control is spotty. Some excerpts from the 5.1 remixes are not that bad, but the stereo ones are impossible to listen to without getting a headache and almost immediate ear fatigue (and I'm not an audiophile!). GowG and grbl like this. This hum is present on the first Atlantic CD of The Lamb as well. ...it's on the original V/C CD too. That's right. I'm beginning to think I might be better off with the DE version after all (not to mention the old CD's fade-in on the opening track!)... I think this hum is slowly getting at me... that is back from day one of the original LP release! It was so prominent on it (UK Charisma) that I used to seriously think it was intended, like some artistic statement! Not to get too far off from Foxtrot... but.. I have a needledrop of the Classic "Lamb" LP (original mix) and I don't recall the hum on that one! I have a needledrop of the Classic "Lamb" LP (original mix) and I don't recall the hum on that one! No hum on the Classic Lamb (or the German Charisma). In fact the hum's only on the UK first pressings iirc. In any case, regarding cd's I'd take the hum on the original 1980's cd's over the dreaded noise-reduction that's on the DE. Plan9, Front 242 Addict, Shak Cohen and 2 others like this. No hum on the Classic Lamb (or the German Charisma). In fact the hum's only on the UK first pressings iirc. That's what I have, the initial UK pressing, bought when the album was first released. I've never noticed any hum... and I'm afraid to listen for it in case I can't un-hear it. HiFi Guy 008 likes this. As I recall...the hum is present in all pre-remix versions, like it or not, accept it or not. The reason it exists is a result of an equipment issue during the mixing of the original master. I never noticed it until it was mentioned during the period of the remixes, now if I try to hear it, it's there. It is an inherent artifact of the original master tape. When they went back to the the original source tapes for the remixes no such issue existed. The Genesis reissues have suffered a problem: Dolby A or B was used when the albums were not. The master tapes for Nursery Cryme were damaged beyond repair as a result of their being played with the wrong Dolby. The US Atlantic and Classic will evidence this. They both sound almost exactly alike! Side one eh, side two better. Ironically, the same for Selling England By The Pound - Classic Records reissue. "when Gabriel sings “old man says you are what you eat - eat well” there is a keyboard in the backround that is very noticeable on my UK original, but here almost completely non-existent." Maybe your system is better. Best I've heard so far is the US red scroll label, sounds ten times better than UK. But "Foxtrot" was not released in a Pink Scroll in the UK. My first version of The Lamb was the old V/C CD, purchased in 1986. I remember not really being aware of the hum until I found a nice US Atco LP (at the urging of a fan/record store owner) a few years later. It was cleaner and more dynamic than the CD issue. Can't comment on Foxtrot specifically but the recent vinyl reissues of SEBTP and W&W were fantastic to my ears, much better than the '94 DEs but those are the only other versions I have to compare to. I really like the Classic Foxtrot LP....I haven't done an A-B with any of my other copies though! No it wasn't and I didn't say that. I meant US pink scroll sounds better than a UK first press. Maybe I should have been clearer. Dang. I'd take my UK Large Mad Hatter B&C any day over my US Buddha Pink Scroll. What do you like better about it?